Hazel was born in Cumbria and studied ceramics at the Manchester College of Art, graduating with First Class Honours. She then went on to teach at Mid-Warwickshire School of Art. 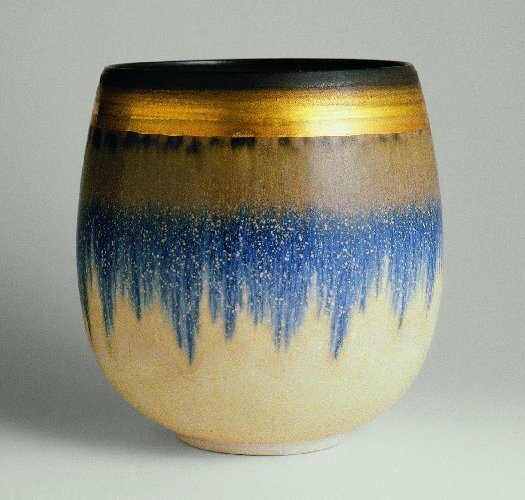 Her own work was initially domestic slipware, then stoneware and in 1977 she set up a studio to produce thrown porcelain bottles and bowls. Though her work is simply finished in subtly coloured mixtures of metal oxides under a dolomite glaze, with restrained use of gold lustre adding emphasis to some of her pieces, clarity of form is the most critically important and main characteristic of her work. She regularly took part in CPA, Gloucestershire Guild and Midland Potters exhibitions. This exhibition will include privately owned pieces of work representing Hazel’s ceramic career, with technical information, as well as photographs and biographical details, telling a story of a quietly modest artist whose talent lives on in her work. There will be approximately eighty pieces for sale.